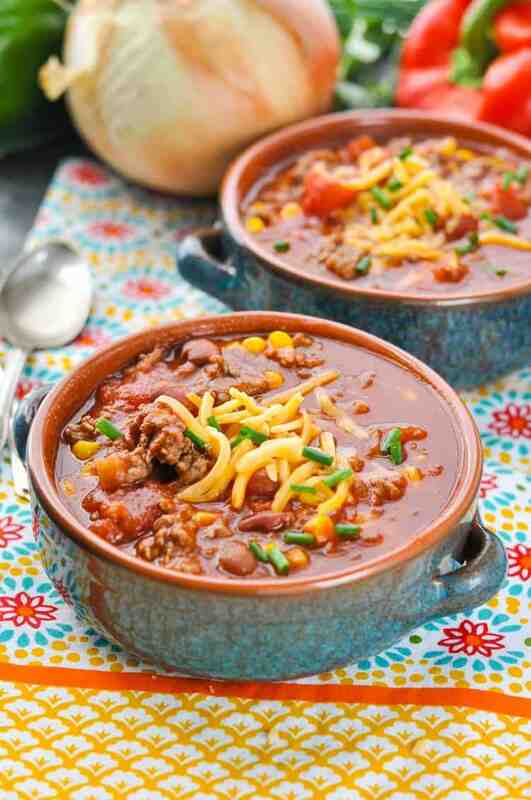 This classic Slow Cooker Chili recipe is my family's favorite easy, weeknight comfort food -- and it's full of lean protein, beans, veggies, and zesty seasonings! For a healthy dinner recipe that you can make ahead, there's just nothing better! 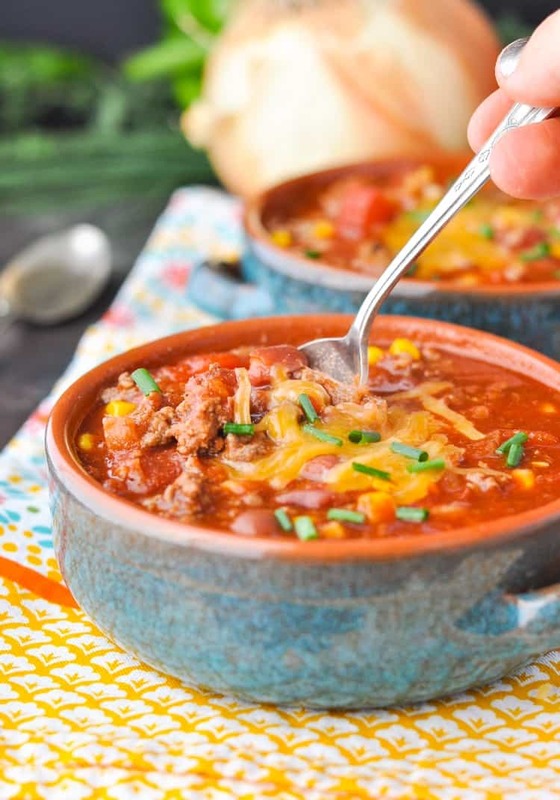 This classic Slow Cooker Chili recipe is my family’s favorite easy, weeknight comfort food — and it’s full of lean protein, beans, veggies, and zesty seasonings! For a healthy dinner recipe that you can make ahead, there’s just nothing better! You guys have probably heard me mention this slow cooker chili on the blog zillions of times in my various Our Week in Meals posts, so I figured it was time for the recipe to have its own spotlight. This meal is a staple dinner in our house (especially at this time of year), because 6-year-old Casey constantly requests it! While I love the ease of my Crock Pot, I’m the first to admit that some recipes just don’t work well with the low-and-slow cooking method. One option that never fails, though? A tasty Slow Cooker Chili! It simmers all day on the counter and just gets better with time. The flavors meld together and the end result is an easy, one-pot-meal that the entire family adores. Toss all of the ingredients into the Crock Pot, set the timer, and you’re done! Do you have to cook ground beef before putting it in the Crock Pot? Yes, in general, it’s best to brown meat before slow cooking. This is because cooking the beef in a skillet gives you the opportunity to drain the fat before you add the meat to the Crock Pot. Unless you’re using extra lean ground beef, the raw meat would result in a greasy chili if not browned and drained first. As I mentioned above, I highly recommend browning the beef in a skillet before adding it to the Crock Pot. That said, you can put raw meat in the slow cooker if you’re using extra lean ground beef (at least 96% lean) or ground turkey breast (99% lean). These extra lean meats will not make the chili greasy. If you do add the raw meat directly to the Crock Pot, be sure to break up the chunks periodically as it cooks. 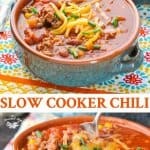 How long does slow cooker chili take? I like to cook my easy slow cooker chili for 6-8 hours on LOW. You can also cook the chili on HIGH for 3-4 hours if you prefer. Can you freeze slow cooker chili? Yes! This is a great freezer meal! Allow the cooked chili to cool to room temperature. Package in airtight containers and store in the freezer for up to 3 months. Cornbread, corn muffins, or corn chips also go well with a hot bowl of chili! To make last-minute dinner prep even faster, I like to brown the ground beef, onion and garlic in advance and then just keep the cooked meat in a container in my refrigerator until we’re ready to use it. This is a step that I can usually do on the weekend so that I only have to dump the ingredients into the pot on a busy weekday morning. 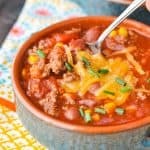 Make slow cooker chili with no beans by omitting the canned beans and substituting with an extra can of corn and some extra ground beef (or another vegetable of choice). Turn this into slow cooker turkey chili by substituting with 2 lbs. of ground turkey in lieu of the ground beef. Use 4 cups of chicken broth instead of the beef broth. Use any of your favorite beans! Instead of the kidney beans, try using pinto beans, navy beans, black beans, or even garbanzo beans. I often use a mix of two different types of beans, too. Heat about 2 teaspoons olive oil in a nonstick skillet over medium-high heat. Cook beef, onion, and garlic in the skillet until beef is no longer pink. Drain. Place beef mixture inside a large slow cooker. Add remaining ingredients and stir to combine. Season with salt and pepper, to taste. Garnish with optional toppings. To make last-minute dinner prep even faster, I like to brown the ground beef, onion and garlic in advance and then just keep the cooked meat in a container in my refrigerator until we're ready to use it. This is a step that I can usually do on the weekend so that I only have to dump the ingredients into the pot on a busy weekday morning. Turn this into slow cooker turkey chili by substituting with 2 lbs. of ground turkey in lieu of the ground beef. Chili is my favorite dish to make in the slow cooker! I’m loving your healthier version, Blair! Sounds like such delicious comfort food and I know I could eat this ALL! Love slow cooker chili 🙂 It’s been so cold over here that I need to make this ASAP! 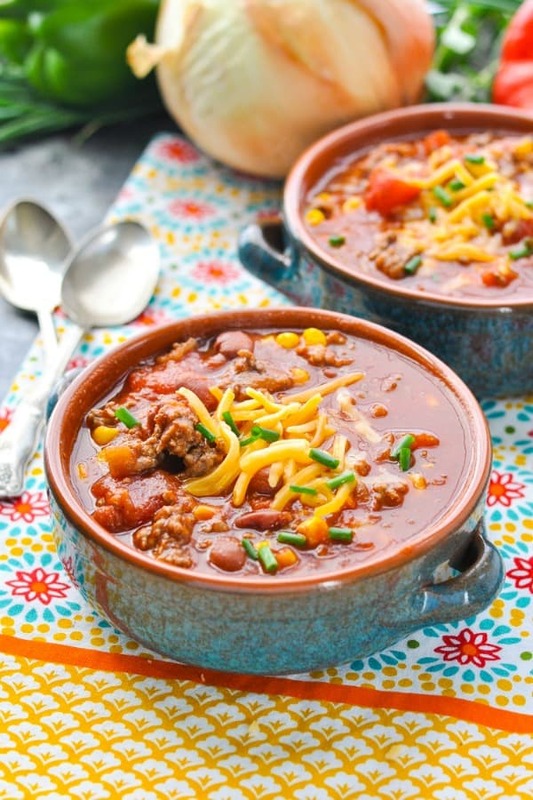 Chili is one of our favourite winter comfort foods and your version looks deeeelish! I never drain the kidney beans, gives it more flavor and I also crush the beans. I have the meat all cooked and seasoned in advance for this weekend. Can’t wait!! It came out great! Super tasty! The entire family enjoyed it 5 7 and 13 year old and my husband and i. We had baked potatoes as well. I will definitely be cooking this again! Yay! Thanks for letting me know, Kim! I’m so glad that it was a hit with your family too! Hi Blair,this chili sounds great can’t wait to try it. I have a friend/sister who’s Vegan. What would your suggestions be to make this a Vegan meal NO MEAT still having amazing flavor without being too soupy due to not having the meat? Hi, Kim! I would turn it into a bean chili for your sister. Just substitute an additional 1 (or even 2) cans of beans for the ground beef. You could mix it up and use a variety of beans — for instance, black beans, pinto beans, and kidney beans — and call it 3-Bean Chili. It will not taste exactly the same as beef chili (obviously), but I’m sure it will still be delicious! Hi Blair, I made your Slow Cooker Chili with Ground Turkey according to your suggestions and it was really good!!! I used 2 cans of garbanzo beans instead of kidney beans and also the chicken broth. It made a lot. I froze some to have another day too!! This was my first time making Turkey Chili and I found your recipe to be very easy!! It was the perfect weekend to make it since we were stuck in the house and getting buried in snow. Thank you for sharing a great recipe!! That’s wonderful, Annette! I’m so glad that you enjoyed it! 🙂 The perfect snow day dinner! Hi again Blair, I forgot to hit the rating. I would definitely give this recipe 5 Stars!! !